Over the past several weeks, there have been a number of people, who consider themselves "pro-salmon" advocates, pushing an agenda of dam breaching in the Pacific Northwest. I have been one of the targets of this campaign, receiving criticism for refusing to consider dam breaching as a realistic option to boost salmon recovery. Unfortunately, breaching proponents have left a lot of facts unmentioned in pushing their agenda - facts that absolutely cannot be overlooked. The dams in question over the last few months are four on the lower Snake River system. The electricity generated by these dams provides roughly 5 percent of all the power consumed in the Pacific Northwest. That is enough to power the entire city of Seattle, or provide about 60 percent of the electricity needs of the entire state of Idaho. The power no longer generated by the dams would have to be replaced by other generation facilities, such as coal or gas-fired turbines (bluefish: Why not wind power? See Capital Press' adjacent article Turbines Fit Well on Farm Land). In the name of the environment, breaching advocates apparently would replace emission-free dams with plants powered by fossil fuels, releasing carbon monoxide and carbon dioxide into the atmosphere, which would result in a net increase of greenhouse emissions. How this is environmentally responsible is not apparent to me. Significant debate remains as to whether dam breaching would even have a positive impact on salmon runs in the region, in part, because a number of dams would still remain on the Columbia and Snake Rivers. What is not debatable, however, is the fact that 75 million cubic yards of silt have accumulated behind the four dams over the years. Silt removal prior to breaching would cost tens if not hundreds of millions of taxpayer dollars. Without removal, breaching would flush all of this sediment downriver, turning the Snake and Columbia Rivers into a muddy mess that would almost certainly be harmful to salmon and other species in the river. I haven't even mentioned the huge problems that would result from the loss of shipping ports in Lewiston, Idaho, Clarkston, Wash. and Whitman, Wash., which account for half of all the wheat shipped down the Columbia River (bluefish corrects: 1.2 million tons of 6 million is 20% - see Snake River Commodity Tonnage). Breaching would mean the end of barge traffic and the loss of a very economical shipping option for Idaho farmers. They would be forced to use trucks or railroads instead, both of which are more expensive. Higher transportation costs hurt farmers, consumers, small businesses and workers. Furthermore, it would take hundreds, if not thousands, more long-haul trucks on Northwest (Washington) highways to make up the difference in lost barge traffic, meaning more-crowded highways and more wear and tear on our (Washington) roads. Having said all this, I don't suggest that salmon are not worth saving, or that they can't be saved. The question is not whether we place salmon, people, jobs or the economy ahead of one another on some list of priorities. Salmon are an important part of Idaho and the region. 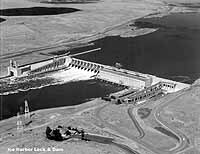 They can and do flourish alongside humans and alongside the navigation, flood control (the lower Snake Dams do not provide flood control), power production, irrigation and recreation provided by the hydropower system in the Northwest. This is a testament to the fact that people and salmon do not have to benefit at the cost of each other. Instead of focusing on dam removal that at best would have questionable benefits for salmon, and would introduce negative environmental effects, I challenge people to start looking at the big unknowns in salmon recovery. Fishery biologists have learned a lot about salmon behavior in the freshwater environment but still know comparatively little about what happens to the young fish after they swim out to sea. I believe that it is important to continue to invest in improvements in juvenile fish passage, habitat and hatcheries. We must also continue to improve freshwater survival so that when the ocean is favorable, endangered salmon will realize the maximum benefit from those conditions, and, when the ocean is not favorable, the salmon will get through the tough times. The ocean environment has an enormous influence on salmon survival, which is why the magnitude of the effects of ocean conditions must be taken into account in gauging the results of the region's salmon recovery effort, instead of just blaming the dams, which provide both economic benefits to the people of the Northwest, and environmental benefits by the power they provide that does not have to come from fossil fuel sources. We can achieve both viable salmon populations and a healthy economy if we focus on the right issues. We can do that without crippling the economy of the Northwest. I will continue working in the Senate to ensure that a balance is met where salmon recovery is consistent with the environmental and economic foundations of the region. Where Could 1150 aMW Come From to Replace Power Generated by LSR Dams? Larry Craig is a Republican U.S. Senator from Idaho.